Not smocked by me. I love the color combination in this little dress. The doll is beautiful. 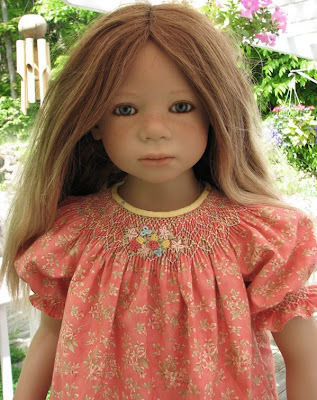 But we know I am not about the doll, though she has a beautiful expression on her face. What caught my eye with this dress was the high contrast of the binding at the neck. Really like that. All of my kids are home, so not much sewing going on in my sewing room. So when that happens, I am grateful it is going on in someone else's sewing room. I love the colors in this little bishop- very unusual, but gorgeous!Thanks for sharing! Someone else just told me about this lady's doll dresses today, too, and I spent a lot of time going back through her flickr account. Her work is amazing! So pretty. I have a question. Do you ever construct a dress with a pleated panel and then smock it? I never have and probably wouldn't even consider it, but I need to get these dresses done while I have the time at home. If I could get them put together, then I could smock when I'm sitting with my mom, my brother, on the plane to my daughter's, etc..... I would think that if I am careful about centering and taking the thread right through the seams that I could pull this off. I would go back to the inside and cover the seams with the bodice lining. What do you think? I know you can buy dresses that are already constructed with a pleated panel or a bishop style that is pleated but not smocked. Hum.........? Oh yeah, I would do the back smocking first before putting the dresses together. I've already done the back sm. on two of the three. 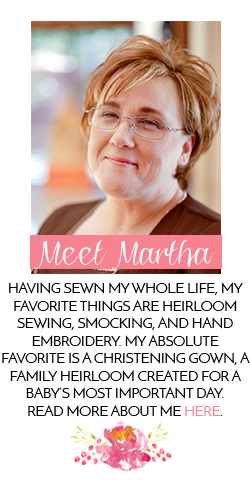 Martha, you have no idea how many people you have inspired with your link to this gal's site! I was the one who shared it with Laura from "Ellie Inspired" & many others. What a treasure trove of ideas! Enjoy your children being back under your roof. They always come first! I finally got back in my sewing room for a bit of quilting (table runner) & now I'm itching to smock something & get busy. its been too long of a dry spell. Thanks for sharing & stimulating our imaginations!! I thought it was a pretty doll and dress, although Mabel sitting next to me thought it was a real girl who looked "creepy." I think the collection you've finished for the baby is *amazing. * Beautiful things!